Health Department has been noticed Health & Family planing job circular last 4th November 2015. Under 7th post title vacancies post are 16. All posts application last date on 6th December 2015. Get s details information visits www.mohfw.gov.bd. Health and Family Planing total posts are- Computer Operator, Steniographer, Evalution Officer, Office Assistant & Computer Operator, Data Entry Operator, Office assistant (MLSS) and Cleaner etc. Above all post application criteria or condition is different than one others to. 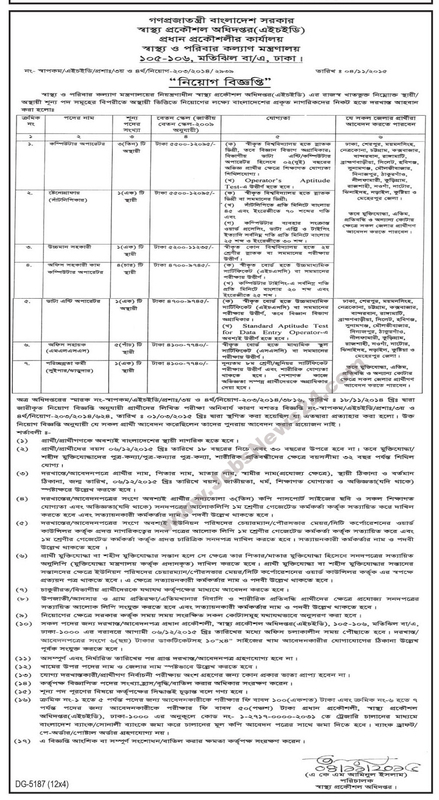 These fourth post Computer Operator, Steniographer, Evalution Officer, Office Assistant & Computer Operator can be application only Dhaka, Sherpur, Mymensingh, Netrokona, Chittagong, Cox’s Bazar, Banderbans, Rangamati, Bhammanbaria, Sylhet, Hobiganj, Sunamganj, Maulavibazar, Dinajpur, Taqoreganj, Nilphamari, Kurigram, Rajshahi, Naogoan, Natore, Jinahdaoho, Narail, Kushtia and Meherpur etc. And others post only application below givens districts. The districts are- Dinajpur, Taqoreganj, Nilphamari, Dhaka, Sherpur, Mymensingh, Netrokona, Chittagong, Cox’s Bazar, Banderbans, Rangamati, Bhammanbaria, Sylhet, Hobiganj, Sunamganj, Maulavibazar, Kurigram, Rajshahi, Naogoan, Natore, Jinahdaoho, Narail, Kushtia and Meherpur etc. And all Bangladeshis freedom fighters children’s and quotas candidates can apply above these post any where in Bangladesh. But theirs mandatory responsibilities is shown the certificates with application forms. But candidates full fill the all condition of Health & Family Planing job. For theses job post written examination will be held very soon announced by MOHFW authority. May be next January 2015 will be held the recruitment’s test of Health & Family Planing. And later will be facing interview of written test passed candidates. If yours any confusion visits health website and likes our Facebook fan page. Thanks to all.